We lived in the attic at Number 3, Norfolk Buildings. My mother, Alice, was a nurse and my father, William, who had fought in the cavalry in the First World War, was too old to fight in this one. He was working in the Monkton Farleigh Mines, which were secret munitions stores just above Bathford. I remember my mother telling me in later years that Father was so cold working underground that in breaks from work he had to fold up his trilby hat and sit on it to stop the cold striking through. They had been married just a year. Times as everyone knows were difficult, money all too scarce and coupons needed for everything! Furniture was basic in the extreme for us, a few items were old orange boxes with covers hastily sewn by my mother in any odd moments she had when not working at the hospital or looking after me! The one good table which Father (pictured left) had acquired, (which incidentally I am writing on at this moment), was carried home triumphantly by my Father on his head from the market. He had come home on the evening of the fateful raid, put his wage packet on the table as usual where his meal was laid. When the sirens sounded Mother wrapped me in their one eiderdown and went first downstairs. Father, I suppose, lingered securing things as best he could. Then the bomb fell! Father was killed outright by the blast. Mother and I were buried in the rubble pinned down by beams and masonry. I, protected by the forethought of my mother and snug in the eiderdown, only sustained a head wound and shock from the blast. Mother was badly injured: her face was smashed, her pelvis broken, and with ground glass fractures of the heel and her eardrums blown in by the terrific blast. Father's body was not found until several days later. 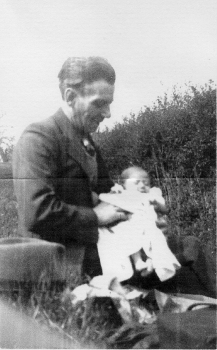 I think my grandfather had to come from Swindon to identify my father and to find my mother who was in hospital. He had to search all over Bath for me as I had been taken into care somewhere. I was only identified by the bad smallpox vaccination scar on the back of my leg. What a mission it must have been for him, but one which was duplicated a thousand times by thousands of people in those dark war days. One can only imagine. Many years later when I was old enough, Mother talked a little to me about her few memories of the time. How, as she lay injured drifting in and out of consciousness she thought she could see the spirits of several firemen or air raid wardens rising up from the ruins. Later she heard that two air raid wardens had been killed on the same site. Another thing she said was that you could actually see the faces of the Luftwaffe pilots as they came low to strafe the streets. 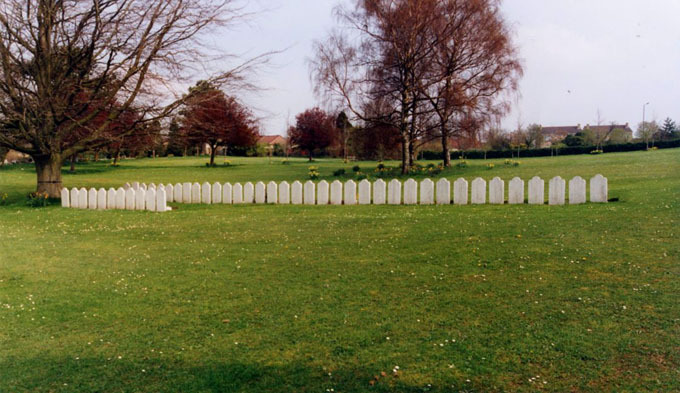 When I finally stopped travelling later in life I went up to Haycombe Cemetery to visit the war graves. To my surprise I found that my father's grave had two other names on it, and later I discovered that there were as many as eight unidentified bodies under that headstone! Mother could never bring herself to visit the grave herself but each year we would listen to the memorial services from Whitehall on Remembrance Day and put a poppy by the one picture we had of him. It was common for quarrymen to sit on their hats, and this tip must have been passed on to those working in the munitions store. The problem was that there was nothing to sit on underground except the stone, and a hat not only offered padding for the uneven surface and some protection from the coldness of the stone, it also prevented the dampness in the stone passing into the quarrymen's clothes. When I first put this story on the website, it contained errors. My thanks to Kathleen for informing me of these errors, and my apologies for getting it wrong in the first place.